Earlier this month, Devin and I spent a cozy evening together in the sugar bush. He made “his-n-hers” fires: his a scary, snorting inferno inside a repurposed oil drum, mine a little smudge fire not far from the wood pile. 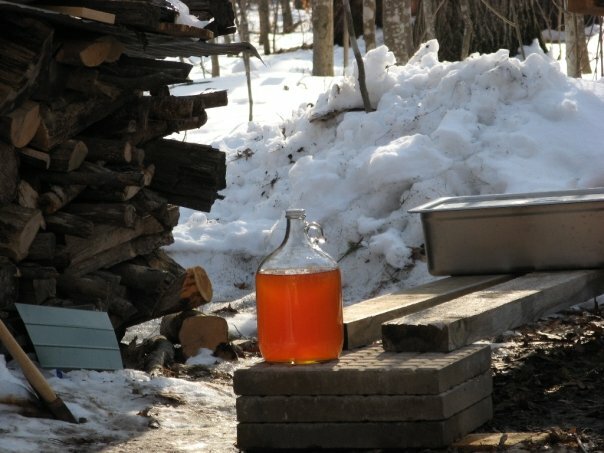 His drew gallons of water off nearly 30 gallons of maple sap, while mine cooked chorizo and attempted the baking of bread. Here we were again in syrup season. There is no end to the poetry of the Wisconsin woods in mid-March, especially when you spend a dozen hours there checking buckets, gathering sap, and watching the boiling down. After 10 years of anguish and elation, Devin has figured out how to drive water out of sap quickly. He knows that if he works inefficiently, he will serve penance until dawn. Monday, Devin tended the fire and the sap gradually took on a golden hue. There was a whistle of many substances in flux — wood burning to ash, metal stressed by heat, water hissing its way skyward, and sap becoming something I have taken to calling “tree candy.” I am such a child of Casey Kasem that I hear pop music in that syncopated release of air. It's a strange accompaniment to the hoot of barred owls and the cries of coyotes, but an incongruity I have long loved. Beside the little fire, I attempted to bake bread, something I had done only once before. I was trying a recipe that I had not yet tested in a kitchen in the daylight. I packed the dough into the woods with the chorizo. We didn’t even think about dinner until about 8. The woods are always full of distractions, and even with Daylight Savings in our hip pockets, time flies. As darkness fell, I worked the thawed dough into as skinny a snake as I could manage. I knew I was in trouble when the dough was tacky. And heavy. Too little flour, I surmised. Still I pressed on, for though we had plenty of other things to eat, I wasn’t going to let a little tackiness and weight thwart me. I coiled the dough around the stick Devin had whittled, propped it against the wood pile, and set to finding snow to clean my dirty hands. When I began turning the dough over the coals, I noted that it still felt heavy. And lo, it was rising on the stick. After 20 minutes (i.e., an awfully long time), Devin joined me, his own fire replenished and pan re-filled so he could take a chow break. He passed his chorizo through the flames devil-may-care style and teased me about the romantic life of a Wisconsin bride, distracting me from my labors so well that I charred the bread tip. I began checking the rest of the small loaf with my head lamp every 30 seconds. Half an hour later, I slid the bread off the stick and irritably examined the residue of unbaked dough. My fantasies of sopping new syrup from the bottom of the pan with fresh bread had been dashed. Even a second, more careful, pass at bread-making — dough to stick, stick to fire, up and down from headlamp glare to golden coals — failed. It was the wrong recipe in the wrong medium. Devin reassured me that the cooked crust I proffered was lovely, and that I should carry on with my planned mopping of the pan. But I no longer had the heart. I just ate my chorizo in a funk, our dog sniffing around me for a little sausage juice and a pat on the head if I could spare it. Cooking, I thought, staring at the uncooperative flames, is a fine personality test. My test revealed (as it has many times before) that I am impulsive and impatient. There are few things I cook twice, because I am always curious about what’s around the corner. Though my sense of discovery is not as urgent and besotted as it was 10 years ago, it is still fierce. When I fail, I quietly fume, but never for long. Devin, by contrast, keeps honing the same materials. Fire and sap meet in a broad, shallow, stainless-steel pan he has used for almost a decade under a roof he built last spring; his syruping technique improves yearly. I admire his patience and skill, but fear I cannot be like him. As we quit the woods at midnight, a full jug of syrup snug in Devin’s right hand, I wondered if I would go back to the old recipe or try yet another new one. I am still wondering.